The jaguar is one of the largest carnivores of Central America, and Costa Rica's largest, an endangered species. It was once fairly common in habitats such as coastal mangroves, lowland savannas, and wet and dry shrub lands and forest up to about 3000ft elevation. Although jaguars seem to prefer peccaries as prey, they also take monkeys, agoutis, deer, birds, fish, lizard, turtles, and other animals. Mud tracks reveal feeding on dead fish, alligators, iguanas and any other carrion left by receding waters. The season of births probably varies regionally. Gestation is about 3 months, and the usual litter is two. Apparently males take no part in the raising of the young, which may accompany the mother for a year. Females reach sexual maturity at about 3 years of age and do not breed in successive years if their young survive. Because of the jaguar's conspicuous tracks, the high value of its pelt, its reputation as a predator of sheep and cattle, and its vulnerability to hound pursuit and hunting, this cat is now rare except in parts of large unhunted reserves. It lives in Costa Rica on the Tortuguero, Santa Rosa, Corcovado and Rio Macho National Parks. 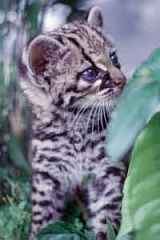 It is also found in the lower elevations of the Cordillera Talamanca and the Jaguarundi Wildlife Refuge. Jaguars seem not to avoid the scent of a man, and one may follow a man walking in a trail. Although unprovoked attacks on men are rare, in Panama a jaguar recently charged a man who was carrying a bag of trapped birds. The main threat to the remaining jaguars in Central America is the clearing of forest for crops and grazing. When roads penetrate a primitive zone, the jaguar and white-lipped peccary (Tayassu pecari ) are the first mammals to disappear. Jaguars seem to be poor colonizers of cutover lands or new areas regardless of the abundance of prey there. Jaguars range from northern Mexico to northern Argentina.